Designing and creating a beautiful garden isn’t just for those of us living in the countryside. 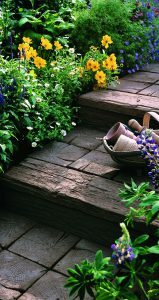 Gardening is becoming increasingly popular for those of us living in cities or towns as a way to grow your own veg, indulge in some of your favourite flowers, or simply make the most of outdoor living (when the weather is good). However, urban gardens tend to be a little on the small side, which can leave owners pondering exactly what to do with their tiny patch. With a few simple tricks, you can change a small garden from something cramped and dark to a space which gives the impression of being much larger. The first tip is to use pale, light colours in the walls and flooring. These can take a little more work to maintain than darker stone or bricks, but paler colours will reflect light and make the space appear larger. This colour palette will also provide a simple backdrop for any type of planting. Using the same tone and texture across horizontal and vertical planes helps to unify the space and can similarly make it appear bigger. 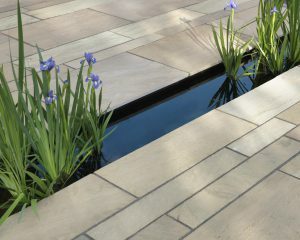 Stone in pale colours, like our Paleo vitrified paving in Gold or the Arctic Granite textured paving in Glacier, can be easily matched to paint colours and give even the tiniest garden an elegant, chic appearance. You can also manipulate ‘vision lines’ to encourage the appearance of a larger space. Using paving, decking or other linear elements, you can make your garden appear wider or longer; for a wider appearance, run vision lines horizontally, and for a longer appearance, run vision lines vertically. Your eyes will follow these lines and trick your brain into thinking the space is much larger than it actual is. Vertical space can be used very effectively in small gardens. Vertical planting, such as a living wall, free up floor space while still providing plenty of beauty and texture. Living wall kits aren’t cheap (although you can build your own) but the options are endless; ferns, succulents, flowers, herbs and even vegetables can be successfully grown in living walls. One way to avoid a small garden really looking small is to avoid anything fussy, so planting should focus on impact, rather than number. Too many contrasting varieties will break up the space and distract the eye. A smaller number of similar, dramatic plants will unite different areas and keep things simple. Kate Gould, writing in the Guardian, recommends ‘rotating’ your garden design by 45 degrees so planting is moved into corners rather than along walls; this gives you more floor space and ensures planting can cover any walling that’s less than pristine. Another tip is to keep any planting under tight control – messy, overgrown plants will soon start to ‘swamp’ a small space. Finally, using reflective surfaces can give the impression of more space in your small garden, working in the same way as light-reflecting, pale colours. Mirrored spaces on walls look chic (keep them a manageable size so they’re easy to clean) while vertical water features, while complex to install, add movement as well as shimmering, sparkling qualities. Whatever you want to use your small garden for, there are plenty of ways to make the most of your space and help it appear that little bit bigger. Try some of our tips to help, and take a look at our other articles for tips and inspiration – from Six reasons to use a garden design to making your garden a sociable space.